The BBC has embarked on transforming its relationship with its audience. Making our online product portfolio BBC iPlayer, BBC News, BBC Sport, etc more personalised, delivering two-way communications and direct marketing tailored to individuals and generating insights from the data we collect for our editorial teams to better curate, schedule and commission programmes. The myBBC programme has built a Personalisation Platform based on knowing our customer’s interests, passions and behaviours. We know this as our customers explicitly tell us like what shows they love or vote on, what sports and sporting teams they want scores for and what musical artists and news topics they want to follow. We also know what programmes they watch, what news stories they read, and which BBC sites they visit. The result is a personalised online experience, tailored marketing and improved contentdiscovery which drives up relative time spent, increased audience loyalty and appreciation. Phil also runs the Homepage, Search and Discovery online products and accountable within BBC Digital for the Digital Creativity initiative. This ambitious project aims to drive awareness and acquisition of “digital creativity” skills with younger demographics. We wish to replicate the BBC Micro moment and excite, engage and enable the next generation of young people with the right skills. 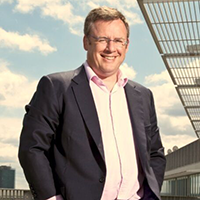 Phil has a track record of large-scale digital innovation and business transformation. Phil was head of the BBC’s Digital Olympics and launch Director for the BBC iPlayer. He has been responsible for the launch of multiple digital products across mobile, tablet, connected TV and desktop including BBC News, Sport, Weather, iWonder and CBBC Playtime Apps. Prior to the BBC he was an entrepreneur – founding of a number of digital media services and consultancy businesses and had spells consulting for both Ernst & Young and Coopers & Lybrand and has an Executive MBA from London Business School.